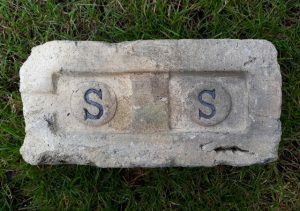 Stamped S S to one side and the other side is blank, however I have a similar S S brick which is stamped Southhook to the front – click me – and I am quite certain this is therefore a Southhook brick. Southhook Fireclay Works, Kilmarnock, Ayrshire. Southhook Potteries, Bonnyton, Kilmarnock, Ayrshire. Southhook Fireclay Works, Dreghorn, Ayrshire. Found by Eddie McLean in Glasgow. Southhook Fireclay Works, Kilmarnock, Ayrshire. 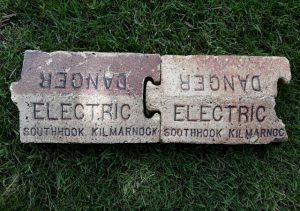 This brick is enamelled to one side. . . .
Found by Eddie Mclean in the Glasgow area. S S is stamped to the rear. 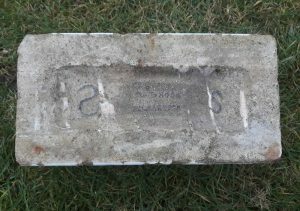 The brick is white enamelled. 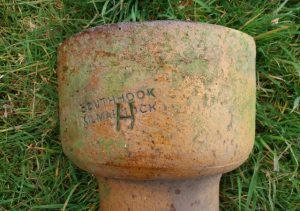 Southhook Fireclay Works, Kilmarnock, Ayrshire. 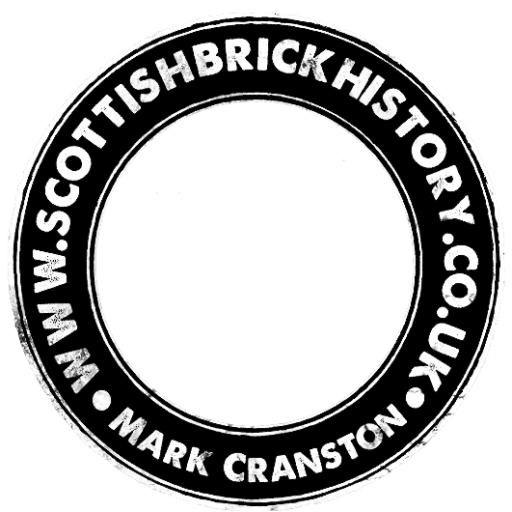 Alternative brickworks include: Southhook Potteries, Bonnyton, Kilmarnock, Ayrshire. 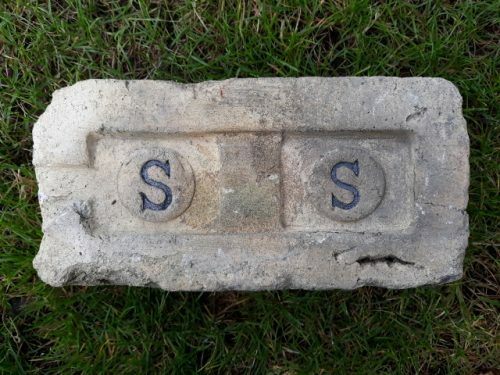 Southhook Fireclay Works, Dreghorn, Ayrshire. . . .
Found by Michael Fallone in the Glasgow area. Southhook and Shawsrigg Fire clay Co Ltd, Bonnyton Works, Kilmarnock. Also note the unusual use of the word ‘and’ as opposed to the normal ‘&’ Side 1 – Southhook and Shawsrigg. 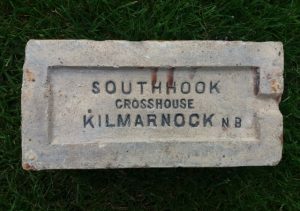 Side 2 – Southhook Crosshouses Kilmarnock. . . .
Found at Auchenheath, Lanarkshire by John Ballantyne. Southhook Fireclay Works, Kilmarnock, Ayrshire. Alternative brickworks include: Southhook Potteries, Bonnyton, Kilmarnock, Ayrshire. 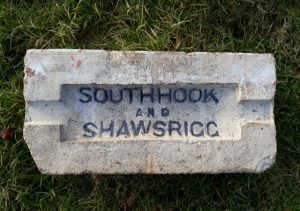 Southhook Fireclay Works, Dreghorn, Ayrshire. .
Found in Central Edinburgh. Ian suddaby. 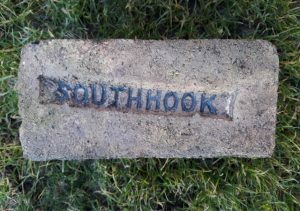 Southhook Fireclay Works, Kilmarnock, Ayrshire. 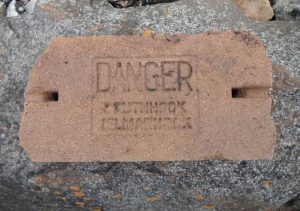 This brick is enamelled to one side. . . .
Found by Michael Fallone in the Glasgow area. 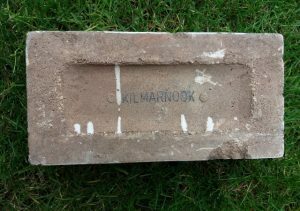 Southhook Fireclay Works, Kilmarnock, Ayrshire. 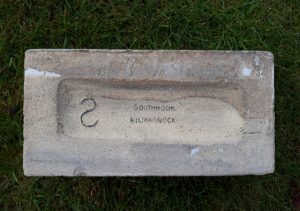 This brick is stamped “Southhook Crosshouse Kilmarnock N.B” to both sides but the arrangement of the words and the frog on both sides is different. Very unusual. Both sides are enamel glazed in brown. . . . .
Southhook Fireclay Works, Kilmarnock, Ayrshire This example is glazed. Southhook to front Kilmarnock to rear . . . .